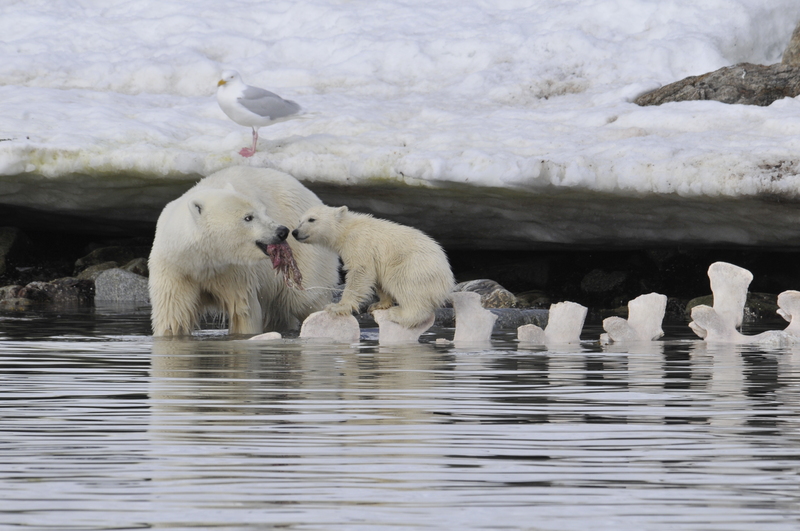 Polar bears need sea ice to survive because it is an essential platform for hunting seals, their main food source. They travel over the ice, searching for breathing holes or seal birth dens. When the ice breaks up in late spring, polar bears in some populations will fast on land, waiting for the ice to re-form so they can resume hunting. Still, polar bears are opportunistic feeders and have been observed in multiple locations eating the carcasses of whales that died at sea and washed ashore. The bears can quickly consume and store large amounts of fat, which works in their favor. In some cases, between 40 and 60 different polar bears have been observed feeding on large bowhead and gray whale carcasses and, in 2017, more than 180 bears were seen scavenging on a single dead bowhead whale. Individual bears frequently return to the same carcass over multiple years. The authors drew upon years of observations in the field to assess the potential importance of whale carcasses and how they might help polar bears survive an ice-free Arctic. It is clear that polar bears persisted through low-ice interglacial periods in the past that resulted from naturally occurring climate cycles. The researchers hypothesized that, to a significant degree, the bears likely survived by scavenging on whale carcasses, storing large amounts of fats when hunting seals was not an option. “I think this is likely one of the most probable explanations for how polar bears made it through previous warm interglacial periods,” said co-author Ian Stirling, former research scientist with the Canadian Department of Environment and an adjunct professor at the University of Alberta, who has studied polar bears for 45 years. The researchers wanted to determine whether enough large whales dying and washing ashore each year could replace seals as a food source for polar bears in some areas. They first calculated how much blubber and meat an average population of 1,000 polar bears would need as a food source each year. Then, they looked at the abundance of gray and bowhead whale populations — focusing on the coasts of Chukotka and Alaska — and estimated the number of potential strandings, factoring in that about 10 percent of whales that die will float to the surface, and only some of those end up on land that is accessible to bears. Their analysis found that during ice-free summer months, a hypothetical population of 1,000 polar bears would need to eat about eight whales, and during the springtime feast when bears eat more, about 20 whales would be needed to satisfy the same 1,000 bears. In the Chukchi Sea, long-term data collected in Russia indicate that enough whales die and float to shore each year to potentially meet this need, the authors found. 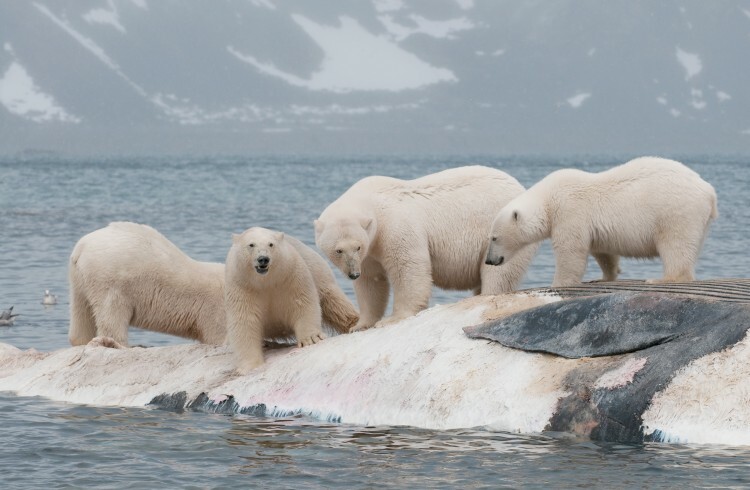 But feeding on dead whales, while possibly critical in historical times, seems unlikely to help most polar bear populations survive a rapidly warming Arctic. The Arctic is home to 19 subpopulations of polar bears, but not every region sees large whales strand and die as regularly as the Chukchi Sea. 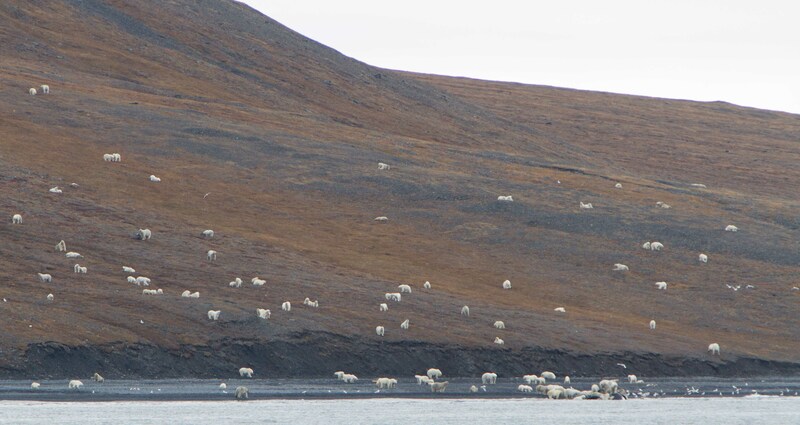 Additionally, though whale carcasses likely helped polar bears survive in past low-ice periods, the Arctic landscape has changed drastically since then. Present-day whale populations are much smaller due to past human exploitation, and recent human activity in the region such as shipping, coastal communities and offshore industrial activity can further impact polar bears, whales, and the ability of bears to make use of whale carcasses. Other co-authors are James Estes of the University of California, Santa Cruz, Anatoly Kochnev of the Russian Academy of Sciences, and Jason Roberts of Jason Roberts Productions. For more information, contact Laidre at klaidre@uw.edu and Stirling at 780-993-5380 or ian.stirling@ualberta.ca.